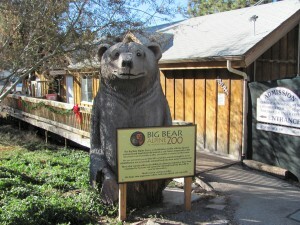 Springtime is a wonderful time to visit the Big Bear Alpine Zoo. The weather is warming up under sparkling blue skies and the animals are emerging from their winter dens. Every day at noon, visitors can get up close and personal with one of the animals at the zoo. The keeper will bring out the animal of the day and share its history and fun facts. Aurora, the Arctic Fox came to the zoo in April of 2012 when she was between one and three years of age. She was on the rooftop of a house in Beverly Hills for three days before Animal Control captured her and sent her to a rehabilitator. 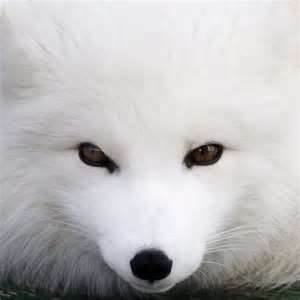 Since arctic foxes are considered to be a restricted species by Fish and Game and cannot be released in California she was sent to us. She is still a little shy and usually can be seen out in her exhibit in the morning and evening. Hucklebeary, our three-legged Black Bear came to us after he was hit by a car and his leg was so severely damaged it had to be amputated. He was very young at the time and we weren’t sure he was going to survive, but he is doing great and has adapted very well to only having three legs. Huckleberry is a big fan of cookies. Another of the Black Bears,Pooh came to us in 2012 when he was probably about 5 years old. 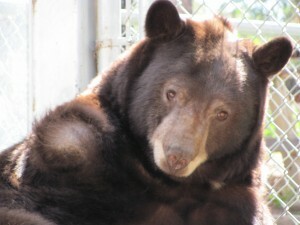 He is the darkest black bear we have and he came to us from Fish and Wildlife. He had destroyed $8000 worth of bee hives and eaten the honey so he could not be left out in the wild since he seemed to have no fear of humans. He has a wonderful temperament and is settling in nicely to his new home. In addition to honey, Pooh loves marshmallows. The Big Bear Alpine Zoo even has Timber Wolves! Wakiza and Nova – they are sisters and who came to us in 2000. 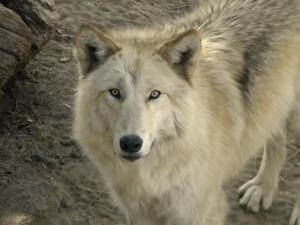 They, along with our male wolf Navarre, came to us from a facility that bred for the movie industry. If the pups were not used for movies, a permanent home would have to be found for them or they would have to be euthanized. Navarre – our adult male came in 2002 from the movie industry. At first the girls pushed Navarre around a bit, but when he reached adulthood, he took his place as the alpha wolf. All three of them get along very well. RS Vacations has several homes that are located close to the Big Bear Alpine Zoo. Come on up to Big Bear and get to know our family of animals in a unique and personal setting. Book your Big Bear Cabin today and come see what all the howling, growling and hooting is about! Clear brilliant days and Moonlit nights can be your view from Moonridge Chalet. This great cul-de-sac location keeps you close to winter and summer fun with Bear Mountain, the Alpine Zoo and the Moonridge Golf Course just a 3 minute drive away. Dining and shopping are less than 1 mile away. Step inside Moonridge Chalet and you will instantly feel at home in this family retreat for 8. All the rooms are on one level and recent fresh paint and carpet make this home a winner. The large and bright living room with vaulted ceilings has plenty of comfy seating around a gas fireplace. Foosball and a flat screen TV with DVD have been provided for your entertainment. There is no Internet service or WiFi at this cabin, however, we find most people carry their own MiFi or phones with WiFi these days. There is so much to do in Big Bear, please take advantage of the mountains and nature and all that it offers! See the pictures to appreciate the sunny adjacent alcove with a bistro table that is a perfect spot for the early riser to enjoy their morning cup of “Joe” while watching the squirrels and bluejays scamper. The fully equipped and charming oak kitchen with laminate wood flooring has cooking extras provided by your hosts with everything you need to cook a family feast, serve meals and entertain your guests. For example: wine glasses from wineries throughout California are provided for your sipping pleasure. The dining area is bright with plenty of room for the gang. A full size washer and dryer are centrally located in the kitchen. There is A/C in the dining room. You will love the master bedroom with its romantic queen bed, private bath, and your own door to the back deck and A/C. The spacious guestroom also has a queen bed and the second guest bedroom has two sets of twin bunk beds for a family or the kids. A second full bath with a shower and tub combo is located between the first and second guest bedrooms. The back deck is roomy and private with dining table and extra seating. The family grilling king or queen will love the versatility of both a gas and charcoal BBQ for your grilling needs. Let Moonridge Chalet be your Big Bear destination to make year round memories! View more photos, check availability and book Moonridge Chalet online at RSVacations.net today and treat yourself to a relaxing Big Bear Lake Vacation. A tanker truck with approximately 10,000 gallons of fuel overturned on State Route 38 (SR 38) about one mile above Angelus Oaks this morning at approximately 9:35 a.m. causing a major fuel spill. As a result SR 38 is closed from Angelus Oaks to Lake Williams. The incident will require hazardous material clean up with a contractor. The route will be closed for an unknown duration: At least until tomorrow, Saturday, April 27, 2013. Be advised that this could become a long term closure for cleanup. Motorists traveling to Big Bear or any area above Angelus Oaks must take SR 330 or SR 18 as a detour. Motorists may also use SR 18 from Lucerne Valley to Big Bear. Motorists leaving the Big Bear area on SR 38 will not be permitted to travel below Lake Williams. Wild Wednesday: Last Minute Spring Special! Why not head up now and enjoy the Springtime beauty of Big Bear? The lake is open, the crowds have thinned out, and Big Bear is starting to bloom! Our Last Minute Spring Specials include 25% off our already LOW Spring pricing. Check out our properties and their great amenities. 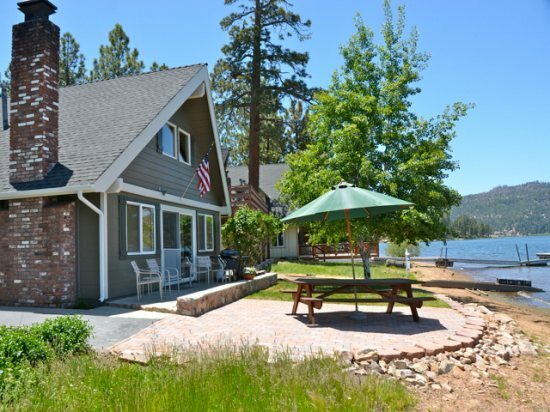 Call us today at 855-366-0800 and come up and enjoy fishing, biking, hiking, and all that Big Bear has to offer! (Picture above is of Lagunita Lakefront. One of our NEW properties. Check out this great lakefront home with boat dock). THIS OFFER CAN NOT BE USED IN CONJUNCTION WITH OTHER SPECIALS OFFERED BY WWW. RSVACATIONS.NET AND HOLIDAYS ARE EXCLUDED. Book your perfect Big Bear Vacation Cabin today and take advantage of this great deal!! Monday Musings: Happy Earth Day! While I don’t consider myself a full-fledged “tree-hugger”, I do care about our planet and try to do my part in preserving it. Growing up in Big Bear, I developed a love for nature in all its forms – A sky so blue that it almost seems unreal, towering pine trees and the many critters that make their homes in them, glorious sunsets over the sparkling lake, grand snow-capped mountains… I am sometimes amazed at the beauty all around me. The world we live in is not always a beautiful place. Natural beauty can be destroyed in many ways – with intent by man, through carelessness and even by nature itself. It can also be an ugly place in other ways. Lately, my hope for mankind seems to be waning. We seem to be surrounded by violence and by those who are intent on fueling hate and destroying the lives of others. But just as I begin to feel that the human race has no redeeming value, I see images of those willing to sacrifice their own safety, and many times even their lives, to help complete strangers. Those who run into the ‘fire’ while everyone else runs out. There is still beauty in the world – both the kind you can see and the kind you can feel. It is my hope that we can strive to keep not only our planet healthy and beautiful but also the human race. Both things take sacrifice and dedication, but both things are worth it. Live beautifully…..
Bayside Retreat offers the perfect Boulder Bay lakeside location with great amenities and location. Enjoy a refreshing dip in the pool or spa located in the complex and ready for your use as a guest after a day on the lake, snowboarding or partaking in one of the many activities Big Bear has to offer. The Rec room features game tables for added fun. Lovely and new Boulder Bay Park is just a short stroll down the walkway. The park has a fishing pier and grills and picnic tables for your dining enjoyment on one of the most picturesque spots on the lake.This first floor 2 bedroom and 2 full bath condo shows pride of ownership with a fully appointed kitchen with NEW appliances including a dishwasher, range, oven and microwave. Dine at the kitchen bar or dining table OR enjoy a meal on the veranda just off the dining area while taking in the sights and sounds of the mountains. In the summer, enjoy the cool breezes off the lake. The comfy living room offers a wood burning stone fireplace and 27 inch TV with DVD/CD player. The sofa opens to a queen size sleeper for your convenience. The master bedroom has a luxurious queen bed with it’s own deck. The guest bedroom also has a comfortable queen. Two full baths with a shower and tub combo are available in the unit. Enjoy sweet mountain dreams at comfortable Bayside Retreat as you get ready for another day of fun in Big Bear! Please NO Smoking or Pets Allowed. View more photos, check availability and book Bayside Retreat online at RSVacations.net today and treat yourself to a relaxing Big Bear Lake Vacation. Big Bear Lake has many summer activities to offer visitors of all ages. One of the most popular is fishing. Whether or not you like to eat fish, fishing is easy to do and can be fun for the whole family. Fishing is allowed from a boat or from the shore and there are many beautiful places where you can set up your day camp and fish. The north shore of the lake has some of the best fishing spots. During summer, fishing is excellent from before sunup to just before mid-morning. In the afternoon fishing is great from early sundown until dark. A California fishing license is required for anyone over the age of 16 years; these can be purchased at various establishments in the Big Bear Lake area. Join us in beautiful, Big Bear Lake for your next adventure and try your hand at fishing. RS Vacations has cabins to suit every need including lakefront homes, so visit us online today to find your perfect Big Bear Getaway!